Althaea Greenstone, MD, Paul Suding, MD, Teresa Kim, MD, Gregory Broderick-Villa, MD, Rupert Horoupian, MD, Steven Stanten, MD, Ajay Upadhyay, MD. Alta Bates Summit Medical Center, Oakland and Berkeley, California & St. Rose Hospital, Hayward, California. Surgical repair of intrathoracic stomach in the elderly remains controversial. Advanced age with multiple associated co-morbidities is perceived as an increased operative risk leading to major complications including death. Up to 40% mortality in emergent or urgent cases have been reported in the past utilizing a transthoracic, open or laparoscopic approach. We reviewed the utility of a laparoscopic approach in all patients irrespective of an elective or emergent presentation in elderly patients. A prospectively maintained electronic medical record was retrospectively reviewed. 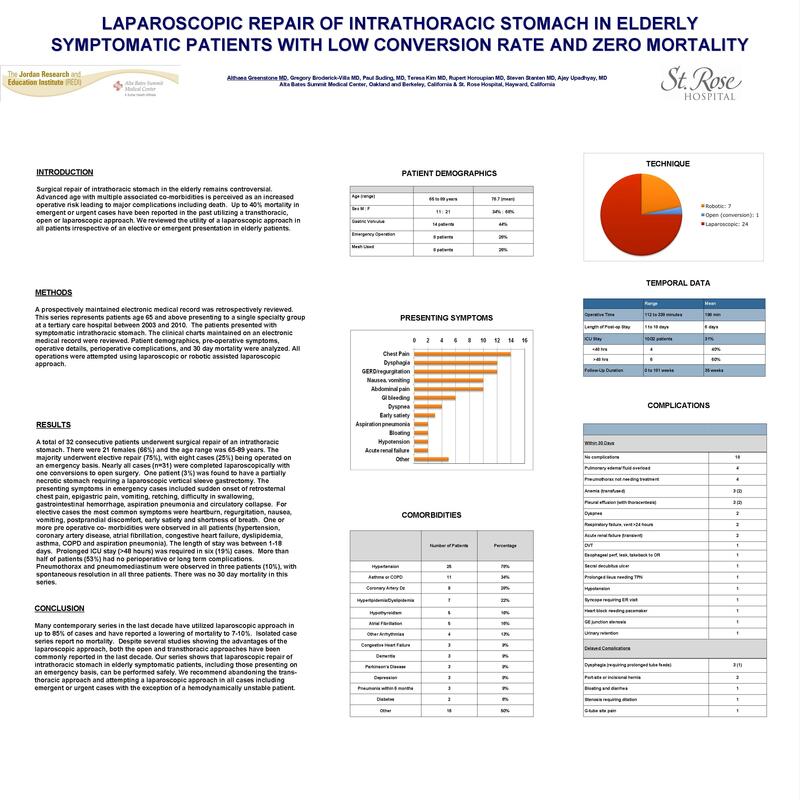 This series represents patients age 65 and above presenting with symptomatic intrathoracic stomach, presenting to a single specialty surgery group practice, at a tertiary care hospital, between 2003 and 2010. The clinical charts maintained on an electronic medical record were reviewed retrospectively. Patient demographics, pre-operative symptoms, surgical decision making, operative details, perioperative complications, 30 day mortality and one year mortality were analyzed. All surgeries were performed using laparoscopic or robotic assisted laparoscopic approach. A total of 29 consecutive patients underwent surgical repair of an intrathoracic stomach at a tertiary care community hospital. There were 20 females (68.9%) and 9 males (31.03%). The age range was between 65-89 years. Seven cases (24.13%) were operated on an emergent basis, 22 (75.86%) underwent elective repair. All 29 cases were completed laparoscopically with no conversions to open surgery. One patient (3.44%) was found to have a partially necrotic stomach requiring a laparoscopic vertical sleeve Gastrectomy. The presenting symptoms included sudden onset of retrosternal chest pain, epigastric pain, vomiting, retching, difficulty in swallowing, gastrointestinal hemorrhage, aspiration pneumonia and circulatory collapse in emergent cases and heartburn, regurgitation, nausea, vomiting, post prandial discomfort, early satiety and shortness of breath in elective cases. One or more pre operative co- morbidities were observed in all patients (hypertension, coronary artery disease, atrial fibrillation, congestive heart failure, dyslipidemia, asthma, COPD and aspiration pneumonia). The length of stay was between 1-18 days. Prolonged ICU stay (>48 hours) was required in five (17.24%) cases. Pneumothorax and pneumomediastinum were observed in three patients (10.34%), with spontaneous resolution in all three patients. There was no 30 day mortality in this series. At one year follow up there was no mortality. Many contemporary series in the last decade have utilized laparoscopic approach in up to 85 % of cases and have reported a lowering of mortality to 7-10%, with isolated case series reporting no mortality. However, both open approach and transthoracic approach has been commonly reported, even in the last decade in spite of several studies showing the advantages of the laparoscopic approach. Our series have shown that the laparoscopic repair of intrathoracic stomach in elderly symptomatic patients, including those presenting on an emergent basis can be performed safely. We recommend abandoning the trans-thoracic approach and attempting a laparoscopic approach in all cases including emergent or urgent cases with the exception of a hemodynamically unstable patient.